It is an island of very recent formation, and one of the youngest islands of the archipelago. It is located in the western part of Galapagos, and separated from its neighbor, the nearby Isabela Island. In terms of surface, it is the third in size of all the islands. On the other hand, The Island itself is a huge active volcano. In the last twenty years, it has erupted several times. For this reason, it has extensive Lava Fields characterized for the scarce vegetation. 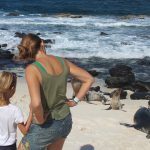 Cape Hammond, located southwest of the island, has been used for several scientific studies on two-haired sea lions, commonly called fur seals. Additionally, the coast between Punta Espinosa and Punta Mangle is one of the most important sites for the study of non-flying cormorant life. 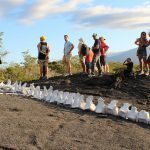 Cape Douglas is the landing site for scientists who want to climb the caldera to study more closely the volcanic activity, the terrestrial iguanas, and the flora. Furthermore, you can also see penguins, non-flying cormorants, sea lions and sea turtles. The landscape seen from Fernandina is beautiful characterized for five majestic volcanoes, but where do all these volcanoes come from? To learn more about how the Galápagos volcanoes originated, we need to better understand the structure of our planet. Geology is a science that helps us understand the characteristics, the environment, and the history of Earth. All these amazing animals and landscapes can be observed aboard the Fragata Yacht. We have designed a series of itineraries in order to suit your needs and preferences, at a very reasonable price. Feel free to contact us if you have any additional information, it will be a pleasure to assist you!